Note: I have written the book for the masses. If at times, you feel like the contents are too obvious, it is just my attempt to simplify complicated topics to the extent of context's depth. A satire on Indian society, politics and democracy! India is, in fact, the world’s largest democracy. Big deal! Nobody is calling it the world’s greatest democracy. It has taken several centuries, a whole lot of bloodshed and an incredible amount of will on the part of millions and millions of people to get democracy evolved to where it is today. Look what India has brought us, devolution! Fragmentation is good for the wine industry and the Android operating system. But, it is neither good for religion nor the political system of India. While “drifting” is fun to watch in the movie “The Fast and the Furious” or to experience while go-carting, it is neither good for a sail boat nor a developing country’s economy. Pravin believes that India has such great, untapped potential and can do far better than it is doing now, if only it gets its act together before it is too late. Let's hope India hits radical reforms before hitting an inevitable crisis. 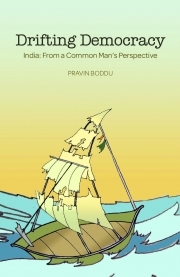 Pravin Boddu is proud to be a product of Mumbai, even though it presented good many challenges as a youth. He especially enjoys it when non-Mumbaites comment “You guys from Mumbai really do sound like you are in a Bollywood movie!” After completing his Bachelor’s in India, he came to US to pursue his Master’s. He fell in love with organized American way of life. After moving to the San Francisco Bay Area, he knew he had found his home away from home. But, eventually, he plans to return to Mumbai after he retires. Growing up, he battled asthma and did nothing other than study. In Bay Area, he discovered another side of himself, getting involved into many sports and activities like long distance bicycling, ping pong, squash, snowboarding, and rock climbing. Pravin is inspired by the “be your best to achieve your dreams” attitude that is promoted in western democratic capitalist countries. He advocates this model for all countries, especially India. Having put adrenaline intensive sports in his rear-view mirror, Pravin is looking forward to the new challenges that life has to throw his way.